What’s the first thing you do when you get out of bed in the morning? A well-rounded morning routine sets the tone for the day and gets you prepped—both mentally and physically—before diving into a packed schedule filled with emails, chores, happy hours, workouts, and more. Our series Morning Person profiles those who have mastered the art of the morning routine. Tune in every Monday morning here and on our Instagram to learn exactly how the pros get it all done before the sun comes up, from their go-to breakfasts to their a.m. workouts. Idalia Salsamendi truly is one of those people who appears to always have their sh*t together. Between managing her clients, launching campaigns, running her own jewelry line (with her mom, how sweet!) and bouncing from country to country, this woman sure keeps herself busy. But beneath the surface are layers and layers of lots of hard work—not just within her career but at keeping her mental health in check. 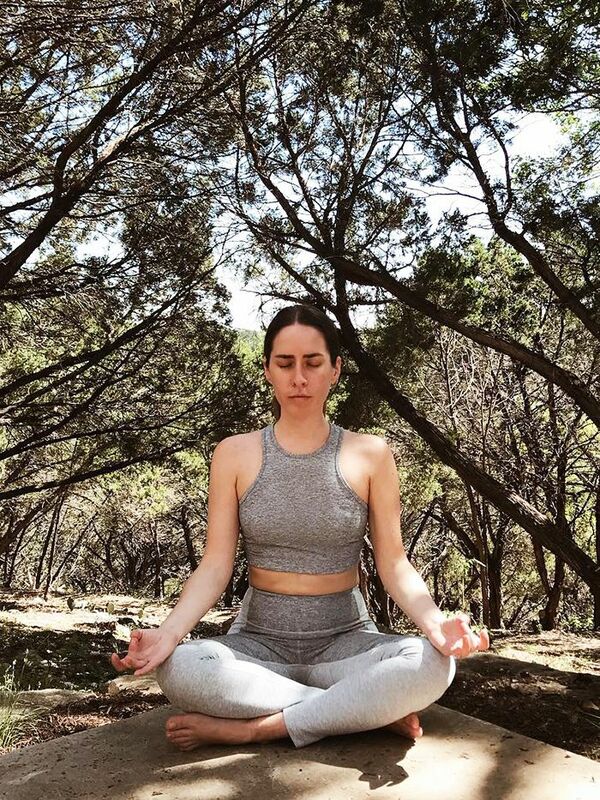 Dealing with clinical anxiety may be an added challenge to an already booked schedule, but Idalia has found ways to incorporate wellness rituals like digital detoxes, gratitude journaling, and lots of cardio to keep her anxiety at bay. Keep scrolling for her morning routine. No matter if it’s the weekday or the weekend, whether I’m in Los Angeles or Paris or somewhere in between, my alarm is always set for 8:30 a.m. Although I do tend to find myself waking up earlier than my alarm, this particular time allows me to feel well-rested and ready for the day. This is also considering I do need my eight-hours of sleep in order to feel like Snow White in the morning with birds chirping on my shoulders… Okay, okay, maybe not exactly like that, but you get the picture. With coffee in hand, I bring out my journal and get ready to start the day by practicing gratitude and writing down everything I’m thankful for. I also love writing down my big ideas and brainstorming creative and fun ways of making my dreams into a reality. This is all about big-picture thinking and being grateful for the present moment. Whenever the weather allows, I always try to do this outdoors to get some fresh air. Right now I'm actually in beautiful Austin, Texas, in this amazing resort called Miraval, which really exemplifies how incredible it is to use nature as a way of connecting to one's intentions and goals. Because I have clinical anxiety and always have to keep my mental health on point, making a conscious effort to start my morning with intention has made such a big difference in my life. I’m such a sucker for cycling and spinning! No matter where in the world I am, I always find a studio and enroll in classes, if only for the day or two I’m in that town. What I find with spinning (just like meditating) is that I'm able to focus on the task at hand and not let my mind wander on my mental "to-do" list. On the days I don’t go to spinning, I spend this time doing at-home yoga, stretching, breathwork, and meditating. If my podcast has gone live that day, I’ll also listen to that while I do my stretches. Because I know everyone always asks about gear, my favorite go-to workout brand is Outdoor Voices, which I’ve been pretty faithful to for the past three years. I’m normally not about cleansing balms, but this not only changed my mind about them in general but has become my go-to cleanser as well. Hands down best toner in all the world. It’s a cult favorite for a reason! Another game-changing product that I rave about all the time. Spraying my face with this Oxygen leaves my skin feeling like I just got out of one of the brand's facial treatments. Thick, creamy and effective. This is a solid eye cream! I’ve been using Darphin for over three years now and I always go back to this moisturizer. I have such sensitive skin (plus rosacea), and this really calms my skin down and gets me going for the day. Another game changing product that I’ve turned all my friends on to. Using the three light therapies this machine provides (I love the red and blue) consistently, I have seen results. After applying all my products, I always try to take 10 minutes to apply the light therapy, which also boosts the products I just put on my face. I’m constantly misting myself daily. Anyone that knows me knows that on my desk and in my bag, I have a mist to keep my face hydrated and glowing. Ready, set, go! I’m officially ready to start my business day. When I’m in the States, I use this time to connect with my consulting clients and to check in with Chriselle Lim and the team to ensure everything is running smoothly with ongoing projects and long-term goals we have set. Also, doing a daily morning check-in with my mom for our jewelry line, LaHavane, really ties in everything for what's to come that day. Since I wear so many different hats for different companies, taking time in the morning to really circle in on my goals helps me set the tone for the day. It also helps me prioritize so I'm not feeling overwhelmed or (more) stressed. Now that I'm in my mid-thirties, I am becoming more and more aware of my mental state when I'm working and am always keeping peace and sanity at the top of the list as much as I humanly can. Anyone that knows me knows that I tend to get addicted to my work, so I deeply value my mornings and how I kick-start my day.